A Suspected thief Sivuyile Ngaka was stoned to death by Khayelitsha residents after they caught him in the act of burgling a house Photo. Nombulelo Damba/WCN. 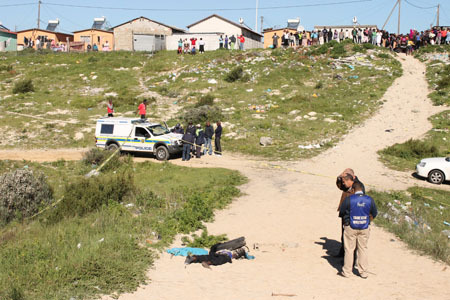 ‘You strike a woman, you strike a rock’ was the cry uttered by a group of women in Kuyasa, Khayelitsha, who killed a 27-year-old suspected thief yesterday morning. Sivuyile Ngaka was stoned to death and partially burnt after he and a friend known as Rasta were allegedly caught breaking into a house in Kuyasa. Ngaka was caught but ‘Rasta’ managed to escape. A resident who did not want to be named for fear of reprisal, said she saw the alleged thieves breaking into the house and cried out for help. She said residents, mostly women, came out and gave chase, managing to catch Ngaka. She said Ngaka was dragged to an open field called and stoned to death before a tire was placed on top of him and lit moments before police arrived. Ngaka’s father Mkhuseli, who was at the scene, said his wife Nolulamile came into the house looking for a cellphone in order to call the police and inform that that their son had been killed. “I tried to ask residents what was happening, but no one answered me”. Some of the residents who were at the scene claimed that Ngaka was “a well known criminal” and were congratulating themselves on “a job well done” before chanting ”you strike a woman, you strike a rock”. One of the attackers said Ngaka had been “terrorizing the area for so many years”. “He has been in and out of jail but never learnt anything,” she said. Mkhuseli said he heard a lot of criminal reports allegedly involving his son as residents complained of being robbed.